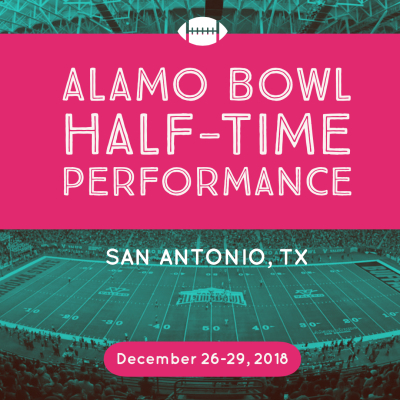 Registration is still open for both the Alamo Bowl & L.A. Elite Trips! 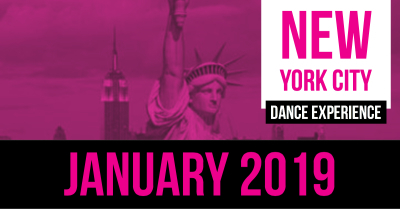 Join us in the Big Apple for a once in a life time dance experience! Enjoy Broadway Shows, Master Dance Classes and Professional Tours of Radio City Music Hall and the Metropolitan Museum of Art. 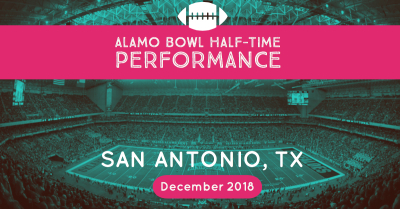 Join us for the exciting 2018 Valero Alamo Bowl Halftime Performance in wonderful San Antonio, TX! Enjoy the performance and a master dance class with choreographer Gigi Torres! 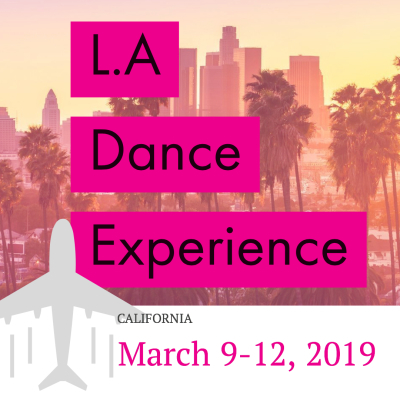 Plan now to travel with to California and experience the west coast dance scene! This trip is still in the planning process but classes likely to happen at The Edge Studio and chances for time at Disneyland and Universal Studios. Payments listed are per traveler. Due Dates must be met to avoid late fees. There is a charge of $50 per week if we do not receive your payment by the due date. If your payment is late we will do our best to keep you as a land only passenger but airline seats may be lost. If any check is returned for insufficient funds or any other reason, a $40 fee will be added each time. If this occurs the replacement must be a money order. All payments must be on time. Credit/Debit Card payments will be processed through Paypal and come with a 4% processing fee. Make Checks/Money Orders payable to: Danceline. Please be sure passenger’s name is clearly indicated on memo space of check. Please note that the $575 deposits are non-refundable. See cancellation policy for other details. We must have at least 50 travelers on each trip in order to guarantee the prices listed, so we encourage you to bring as many in your group as possible. We are pleased to offer a $25 discount per person if your group has 30 or more travelers. They can be dancers, chaperones, family or other guests. Call our offices for further details. Initial Deposits of $200 and $350 are non-refundable. From Oct 15 to Nov. 10 travelers who have paid over the deposit amounts are eligible for a full discount less the deposits and a $100 cancellation fee. After Nov 10th there are no refunds. A name change can be made for no charge until Oct 1st. After Oct 1st there is a $75 fee for each name change. Please remember your final balance is based on total number of participants in your room. If there have been cancellations in your room and there has not been a replacement, your final balance may be increased. 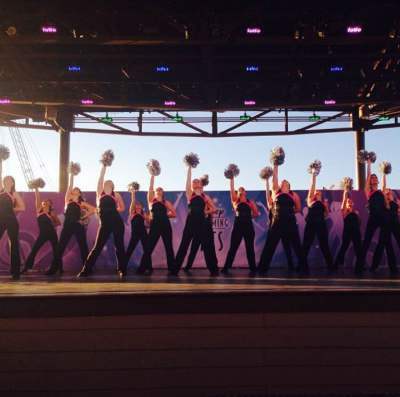 Elite Dancers are selected at all of our hotel and private summer camps. Each Elite Dancer is invited to travel with us in the following year to exciting destinations where they will perform and expereince the professional dance world! We congratulate all Elite Dancers with a personal certificate and each are given the opportunity to purchase an Elite Patch on the last day of camp! If you would like to be placed with other groups to have a triple or quad rate, just indicate this on registration form and we will do our best to accommodate you. Please note that we cannot guarantee this. In the event of a natural disaster, terrorist attack, health epidemic, or involuntary cancellation of Elite date or location no refunds will be made. Danceline will make every effort to reschedule or relocate the event. All Elite performers/travelers must be in good standing with their team and director at time of trip departure. If participant has been removed or quit the team, she may not be allowed to travel unless director gives special consent and it is approved by Danceline Executive Director. No special refunds will be made for these circumstances. A replacement may be made with an additional fee. Please note that Danceline requires all students to be chaperoned at the rate of one adult per six dancers unless prior permission from Executive Director has been given. Dancers are required to travel with an adult chaperone. We require a medical release to accompany your second payment in October of every traveler attending our Elite Trip. This Medical Release Form will be sent after we receive your deposit in September and is also available for download by ​ clicking here . A complete rooming list is due with second payment in October. Be sure to fill in rooming list requesting quad, triple or double room when you register. Name should be your legal name as it appears on Driver’s License and/or passport. If name listed on registration and rooming list is different you will have to pay a name change fee. The agents with which we travel are very strict about this.